A dependable guide for making straight scores. The 0.25" (6mm) thickness fits nicely with hand-held glass cutters. Made of lightweight and durable clear acrylic with a non-skid backing. 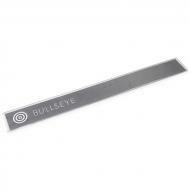 Available in three lengths: 11 in (28 cm) for small projects; 22 in (56 cm) for cutting across and 36 in (91 cm) for cutting down the length of a standard Bullseye glass sheet.